Hi guys!! ARIMA is the part of time series tutorial series, in few last tutorial article we have learned alot about time series data like reading, plotting, decomposing and forecasting time series data. By reading previous articles you must have gained some knowledge about time series. So in this tutorial article we will learn about ARIMA models. Why do we need ARIMA models? Ok let me explain, in last article, we learned forecasting using simple exponential smoothing method. Simple exponential smoothing(SES) methods are useful for making forecasts, but SES method does not make any assumptions about correlations between successive values of time series. However, if you want to make prediction intervals forecast made using exponential smoothing method, the prediction intervals requires that forecast errores should not be correlated and normally distributed with mean zero constant variance. 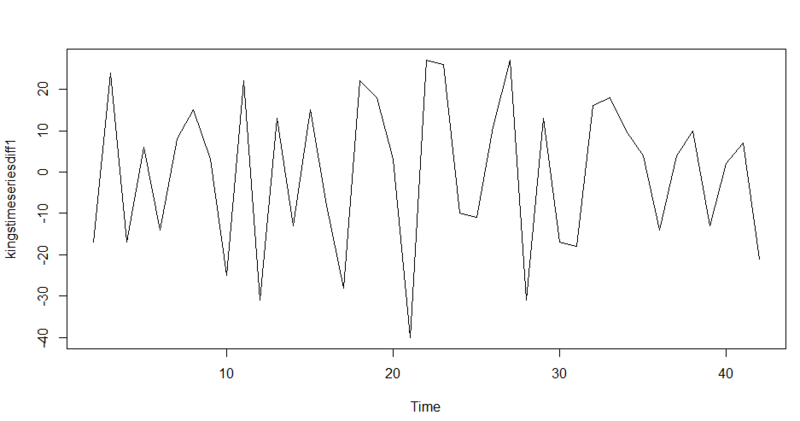 irregular component of a time series, that allows for non-zero autocorrelations in the irregular component. Selecting a candidate ARIMA model. ARIMA models are defined for stationary time series. Though if you want to start off with non-stationary time series, therefore, you will need to differenciate the time series until you get stationary time series. If you have to difference the time series d times to obtain a stationery time series, then you have to make ARIMA(p,d,q), d is the order of differentiating the time series. Now you must be curious like me, what are the other parameters(p,q), p and q are the correlation and autocorrelation values of ARIMA model. 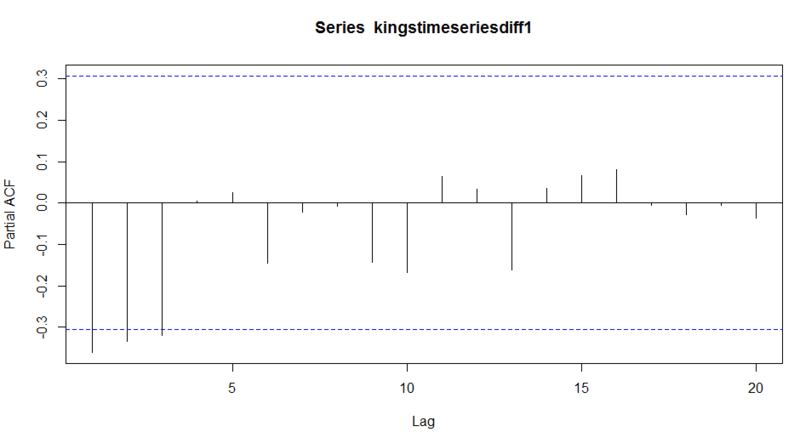 You can difference a time series using the “diff()” function in R.
Lets take an example of kings death which we have used in how to do time series analysis using R part-1. Lets see this data is stationary or not? of this irregular component, if so, this could help us to make a predictive model for the ages at death of the kings. Selecting ARIMA model means finding the appropriate values of p and q for ARIMA(p,d,q). 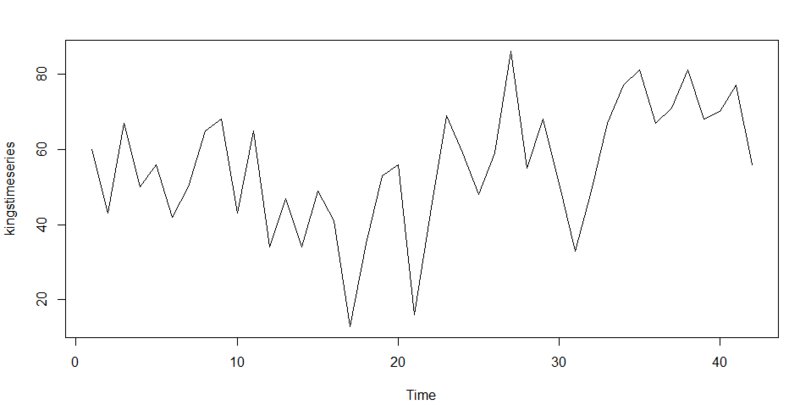 Lets find out the correlations and partial correlation between the successive intervals of time series data. other autocorrelations between lags 1-20 do not exceed the significance bounds. we can see from plot, that partial autocorrelations at lags 1, 2 and 3 exceed the significance bounds, are negative, and are slowly increasing with increasing lag (lag 1: -0.360, lag 2: -0.335, lag 3: -0.321). The partial autocorrelations tail off to zero after lag 3.
zero after lag 3, and the autocorrelogram tails off to zero. partial correlogram tail off to zero. the ARMA(p,q) model has at least 2 parameters. Therefore, the ARMA(0,1) model is taken as the best model. X(t) is the stationary time series. μ is the mean of time series X(t). Z(t) is white noise with mean zero and constant variance. θ is a parameter that can be estimated. We can directly form appropriate ARIMA model in R by using auto.arima() function and forecast package. 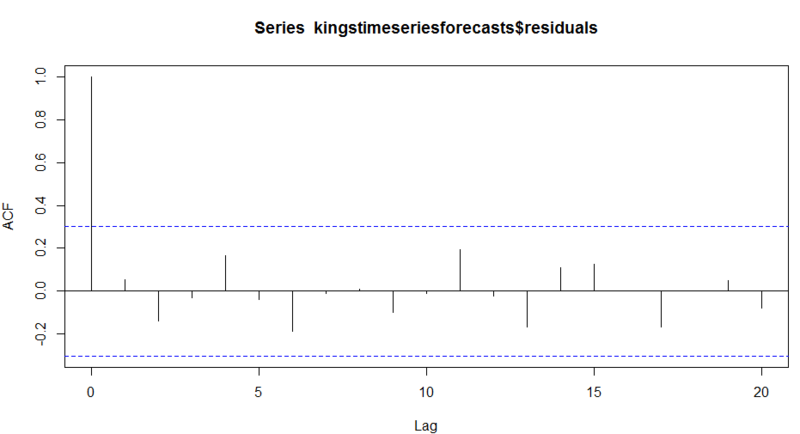 Lets stat forecasting, we discussed above that an ARIMA(0,1,1) model seems appropriate model for the given time series. You can specify the values of p, d and q in the ARIMA model by using the “order” argument of the “arima()” function in R. To fit an ARIMA(p,d,q) model to this time series. An ARMA(0,1) model can be written X(t) – μ = Z(t) – (θ * Z(t)-1). From the output of the “arima()” R function, the estimated value of θ (given as ‘ma1’ in the R output) is -0.7218 in the case of the ARIMA(0,1,1) model fitted to the time series. 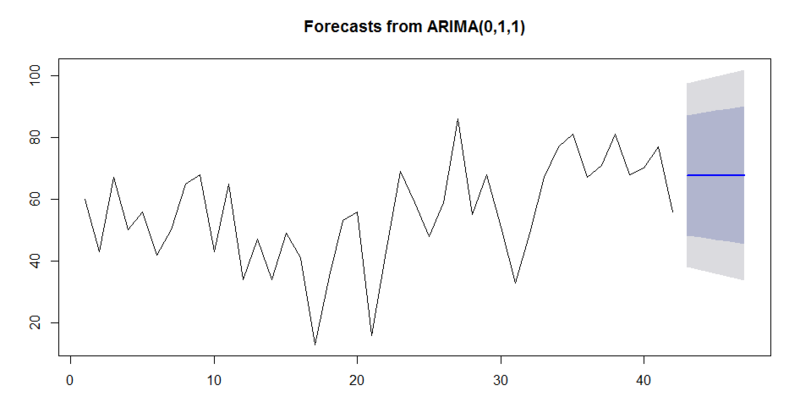 We can then use the ARIMA model to make forecasts for future values of the time series, using the “forecast. 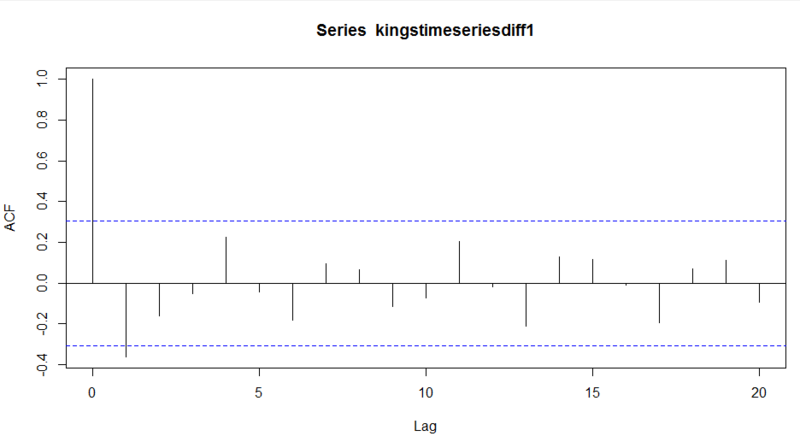 The original time series includes the ages at death of 42 kings. The forecast.Arima() function gives us a forecast of the age of death of the next five kings (kings 43-47), as well as 80% and 95% prediction intervals for those Predictions. The age of death of the 42nd English king was 56 years, and the ARIMA model gives the forecasted age at death of the next five kings as 67.75 years. ARIMA model are normally distributed with mean zero and constant variance, and whether the are correlations between successive forecast errors. autocorrelations in the forecast errors at lags 1-20. The time series’s tutorials series is completed, if you have any doubts please ask in comments or shoot me an email @ irrfankhann29@gmail.com. seasonality and event(like holiday event) how did we account for that.